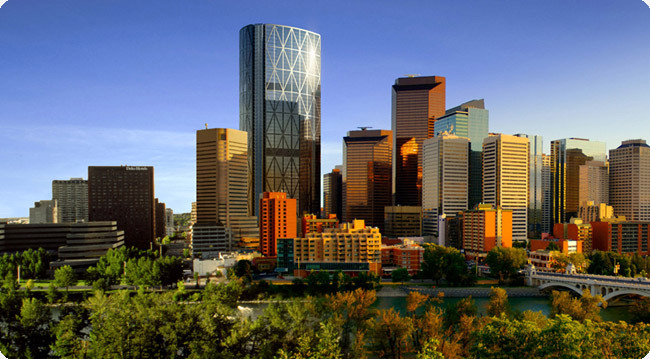 The future Bow building, located in Calgary, Alberta Canada, is an innovation in both architectural and shoring design. At 58 stories and with a footprint of two city blocks, The Bow will be the largest building in Canada west of Toronto. It will be an impressive addition to the Calgary skyline and will serve to redevelop the east side of Calgary’s downtown. With 850 caissons to be drilled, combined with extensive shotcrete, there will be 13,200m2 of total shoring implemented for the construction of The Bow. This is the largest shoring job of its kind in western Canada. HCM Contractors Inc. is proud to be part of the team constructing this ground breaking new building for Calgary. For this project, Ontario based excavation-shoring, foundation specialty contractor HC Matcon Inc. expanded into the Alberta market as the newly incorporated company HCM Contractors Inc. A new team was formed to build HCM Contractors Inc. from both experienced HC Matcon Inc. employees and new hires. 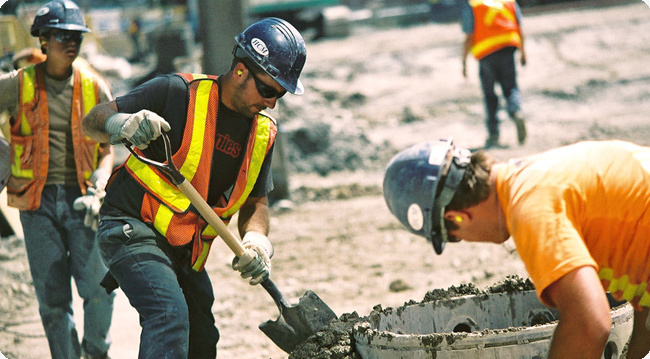 Now based in Calgary, HCM Contractors Inc. brings with it the expertise that has made HC Matcon Inc. respected in the Ontario specialty shoring market. 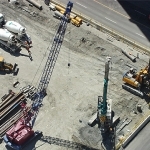 HCM Contractors Inc. has invested heavily in new equipment for this shoring project. 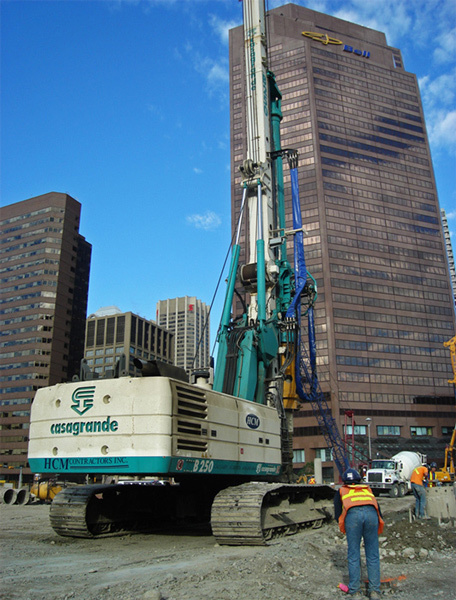 With the purchase of two new state of the art piling drills, the Bauer BG2 24 and Casagrande B250, HCM Contractors Inc. has risen to the forefront of caisson drilling in Calgary. 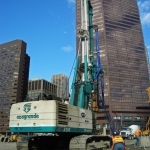 The two machines allow HCM Contractors Inc. to handle jobs of impressive size. Purchases include a two Casagrande M9 drills for drilling tiebacks as well as additional foundation equipment. With design from Toronto based Isherwood Associates, HCM Contractors Inc. is introducing the Berlin wall method of shoring to the Calgary construction market. 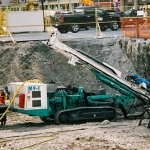 The Berlin wall method involves a combination of caisson wall and shotcrete. The soil conditions in Calgary are unique due to the city’s glaciated geological history. The soil is composed mainly of gravel and cobbles– transitioning to rock layers of mudstone, siltstone, and sandstone. No one shoring system is ideally suited to all layers. 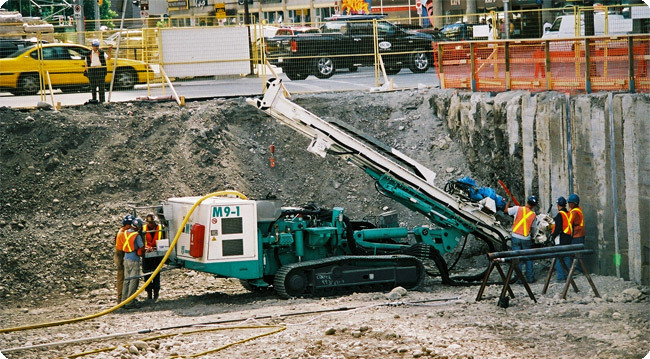 The Berlin wall method allows the shoring system to be tailored to the variable soil conditions of Calgary while still passing on a significant cost saving to the customer. The caisson wall, completely enclosing two city blocks, penetrates the lower rock to cut off water in the gravel and eliminates all upper ground loss, unlike what would be typical of lagging systems. At the same time, the caisson wall provides greater stiffness and controls the movement of the shoring wall. At lower depths, the rock requires less support and caissons are not needed– anchored shotcrete provides an optimal solution. HCM Contractors Inc. is employing a full survey crew to guarantee millimeter accuracy throughout the shoring installation. Our team utilizes a total station system with targets on the bottom and top of each pile as well as on neighboring buildings. This ensures precision with the caisson layout and implementation of the shoring system. The project also includes the installation of twelve vertical inclinometers and twelve rock extensometers. 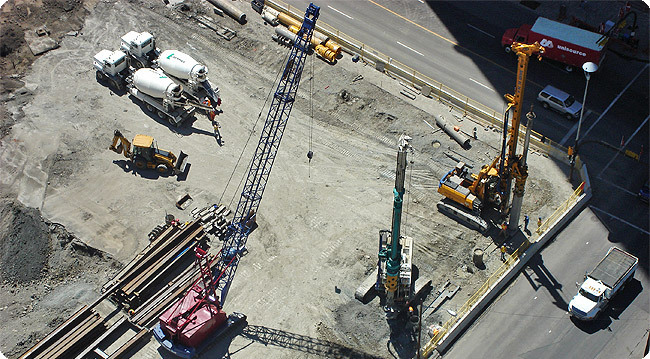 This is the first time that rock extensometers have been used in construction in western Canada. These instruments provide us with sub millimeter data on movement within the shoring system. With precision monitoring of moments during excavation allows for additional anchors to be installed on an as required basis.